In the past year, I haven’t been able to post much due to a very hectic schedule. It’s strange how life will suddenly get so busy that it is dizzying thinking of the things to do and see. Despite the busy schedule, I have managed to knit a few little items here and there. When I bought my birthday yarn, this project was what I had in mind. I didn’t get to start the sweater until September and almost well out of the warm weather that it was intended to be worn in. Birthday Yarn from The Yarn Mart! I used Size 7 knitting needles which are smaller than the pattern originally used because, everyone said that this linen yarn stretches a ton and I didn’t want a sweater that reached my knees. Before I blocked the pullover, I had been a little worried that I had made it too small. However, the linen yarn shocked me with the stretch-ability in the blocking process. I had a few mistakes while knitting the bottom front that resulted in my meeting point being a little off-kilter in the front. In addition, I had some issues with knitting the right sleeve. When I was half-way through knitting the right sleeve, I realized that I had been knitting the sleeve backwards as the sleeve pattern on the right side didn’t match either the pictures of the sleeve or the rest of the sweater body. I frogged the right sleeve and reversed the sleeve directions to have a right-side-out right sleeve. My copy of the pattern doesn’t mention a difference between the sleeves and I’m not sure if there needs to be an errata (or if I just need explicit instructions when knitting). I bound off with a size 8 knitting needle due to my tight binding off tendencies. Despite my mistakes and confusion with the sleeve, I love this pattern and the resulting sweater. I can’t wait to layer it with other long-sleeve shirts to wear for the remainder of the cold fall and winter seasons. It will look equally lovely as a swimsuit cover up in the summer or a light pullover in spring. Patterns: Meeting Point from Holla Knits! 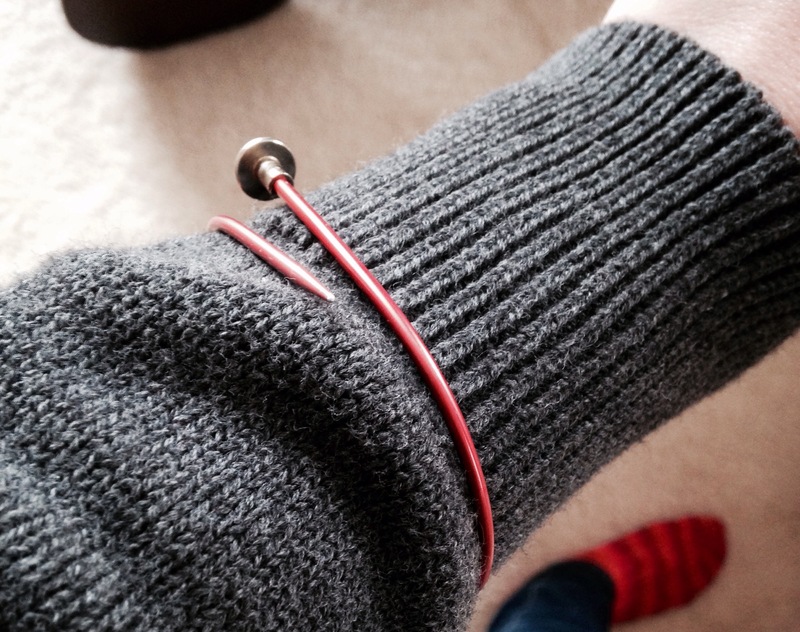 Also … I’ve been drooling over knitting needle bracelets or bangles ever since I saw them on Etsy years ago. A few weeks ago, I managed to make one of my own. I used this online tutorial, but the temperature setting for the metal needles only worked well with the smaller gauge needles. This bracelet was a size 1 needle. Back in April, I finished a sweater that been on my knit wishlist for a few years. Alas, it has been too warm to wear the adorable sweater. However, with fall upon us, I am enjoying this warm knit in the chilly weather. 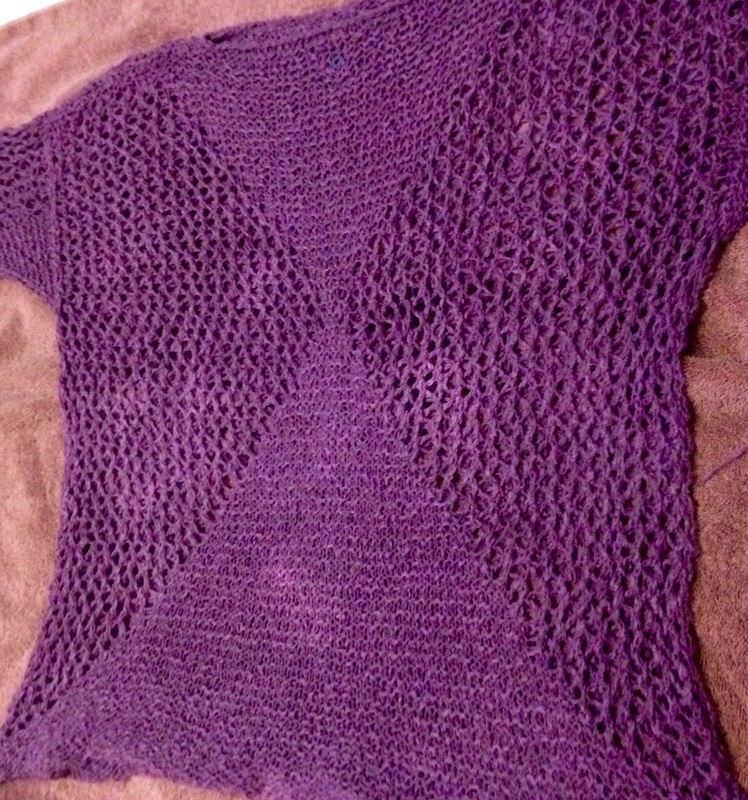 I only altered the ribbing from the pattern. I omitted four rows of ribbing at the bottom of the sweater and on the sleeves; however, my measurements were roughly the same as the pattern’s finished measurements. My sweater was even featured in Holla Knits! KAL (knit along) finished object highlights!! Patterns: Jilted from Holla Knits! Some Miyazaki/Studio Ghibli baby knits happened. Hayao Miyazaki is the Japanese film director who has created such gems as Howl’s Moving Castle, Kiki’s Delivery Service, My Neighbor Totoro, and Spirited Away. These cute knits were made to pay homage to the fire demon, Calcifer, from Howl’s Moving Castle; Kiki’s big red hair bow in Kiki’s Delivery Service; and My Neighbor Totoro. Let me know what you think. These cute woodland knits were made for my co-worker’s soon-to-arrive bundle of joy. Almost a year ago, I got a new and interesting job – which meant getting a new office to decorate. Finally, I had a reason to make some of my glittery Pinterest dreams come true and I can definitely say that creating office art is fun. To honor my state, I choose a DIY State art. 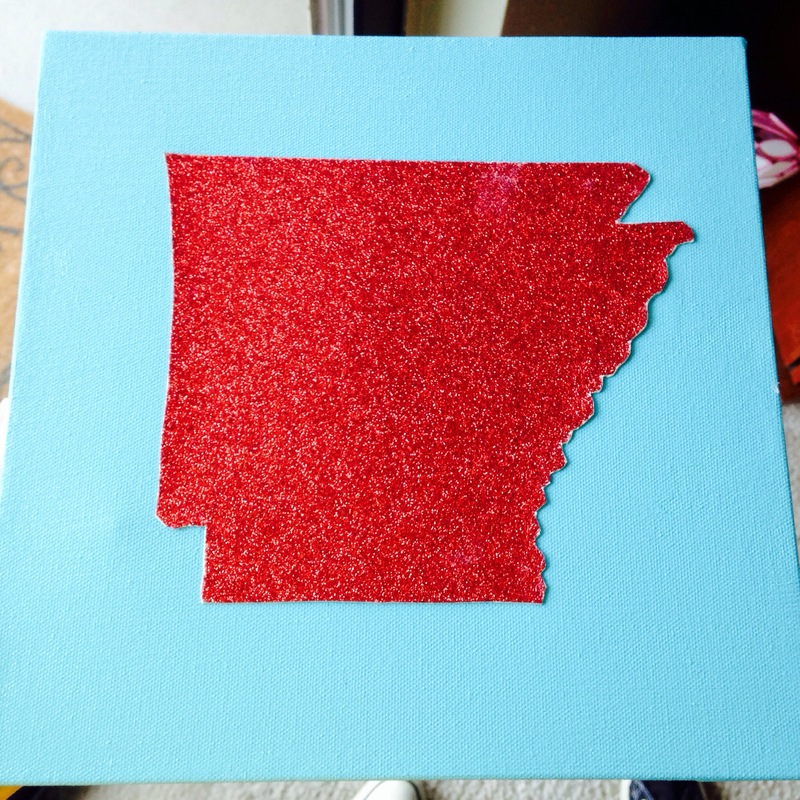 It was one of my simplest art projects – a 10″ x 10″ canvas painted turquoise with scrapbook red glitter paper in the shape of Arkansas glued to the middle. I also made another artwork similar to Papery and Cakery’s Sprinkle Artwork. 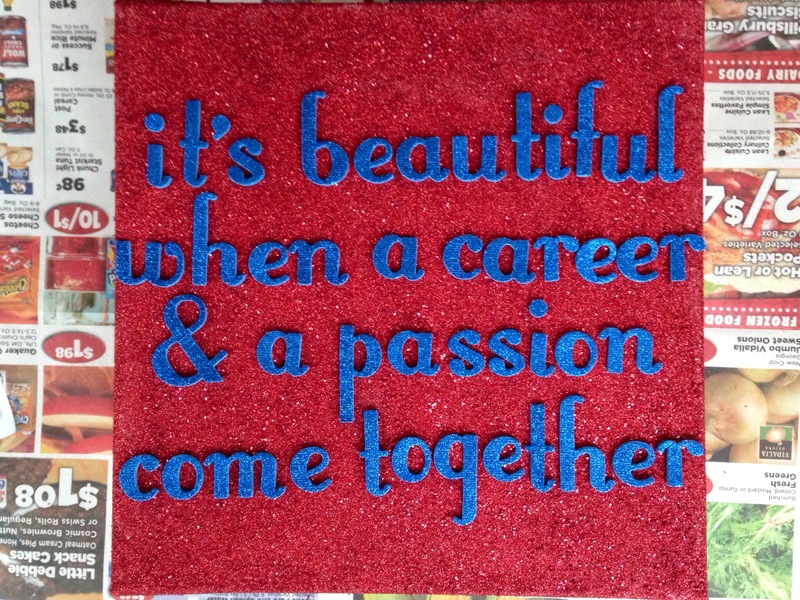 I used another 10″ x 10″ canvas, tons of craft glue, two different type of red glitter (micro and normal), and blue glitter letter stickers. My kerning isn’t the best, but I like it.